Raising her daughter on her own after her husband's suicide, Carol was a member of Rick's group when they encountered Tyreese. The two struck up a relationship, but his betrayal led her to become increasingly unstable. Carol was done a huge service by the Walking Dead TV show. She was a pretty forgettable character in the books - odds are if you remembered her at all, it was as "'throws herself at everyone' woman," and yet she was part of the group since the beginning! The Minimate is wearing a pink cap and a brown leather jacket, and her face is painted with a disapproving frown. To give Carol a different look, the set includes an alternate piece of hatless hair, and a set of pale green arms that match her shirt (meaning that you can take her jacket off, for those days when it's cool enough to just get by with a sweatshirt). She'll still never be as cool as TV Series Carol, though. Shame the Minimates' license doesn't cover that as well. Survival tip: in the event of a zombie outbreak, do not attempt to analyze or understand the zombies. Scientific theory goes out the window if your test subject takes a bite out of your arm. Survival is all that matters. The Pole Zombie is easy to identify - there aren't a whole lot of zombies on poles, you know? Well, mostly. 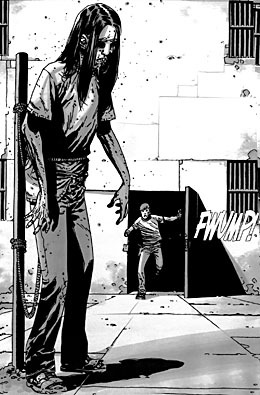 Anyway, this zombie showed up in issue #41 and #42 (a rare multi-issue appearance! ), and was indeed tied to a post so it could be studied. She(?) is wearing a green shirt and tan pants, and long, stringy hair spills down over her(?) shoulders. The pole is included, and has "ropes" running to the figure's neck and waist. The bottom has a hole so it can plug onto the included base and not just flop around behind the figure. 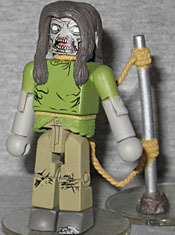 This entry was posted in Art Asylum, MMMR, TRU and tagged Minimates, zombies. Bookmark the permalink.